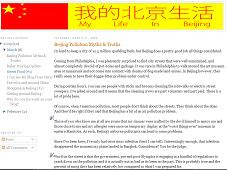 Living in Beijing - My Beijing Life: More Feedback! Thanks to the magic of Google analytics, I can tell that you are reading this post. Actually I can tell that a LOT of your are. And I can tell WHO you are. Most of you are people I know. Some of you are random people that have found my blathering posts through Google. To the first group, I thank you. To the second, I apologize. Either way, your visitorship works out great for me. When you come, and especially when you click on the ads, I make money for street food. And, we all know how much I like street food. However, take a moment to be more involved. Comment on my posts. Ask questions. Make snide remarks. Tell me I'm a self-indulgent fool for having a blog. If you have a blog, ask me to link to it and we can be bloggy linky buddies. You'll notice I've linked to several friends blogs at left. Thank you for your patronage and keep reading.